After a few years, I simply dropped having a middle name. I was Linda Weiner. It wasn’t a last name that I particularly liked either. There was just too much childhood teasing — Oscar Meyer Weiner hotdogs and worse. Why couldn’t I have a normal last name? I especially felt this frustration given that my family had now moved from the working class refinery town of Chester, Pennsylvania, to Wynnewood, one of the towns of Philadelphia’s prominent Main Line. My schoolmates attended dances at the nearby Merion Cricket Club, but Jews were not allowed. We got along well enough at school, but clearly there were differences. My name gave away my legacy. 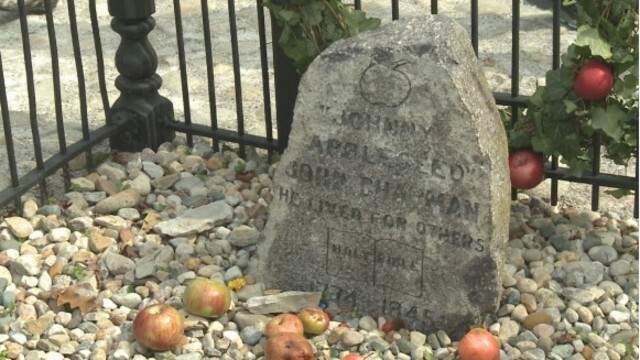 The English apple, Bloody Ploughman, was named after a ploughman who was shot by a local gamekeeper for stealing apples. And the popular, Granny Smith, was named after an Australian woman, Maria Smith, who rescued an apple growing in her compost heap. The Bramley, another English apple, was named for a Mr. Bramley who bought a house from Mary Ann Brailsford where she had planted a seedling which grew astonishingly good cooking apples. Bramley allowed a local nursery to propagate it on the condition that it would be named after him. I might have avoided planting this apple if I’d known its patriarchal history. A group of new apples sport the name, ‘Crisp,’ including Honey Crisp, Golden Crisp, and Cosmic Crisp. The “crisp” in the name indicates that these apples have been bred to be particularly crispy, something the early 21st century public desires. One of my favorite new apples is Bonkers, a cross between a Delicious and a Liberty produced by Cornell University's apple breeding program in Geneva, New York. Bonkers is large, extremely crispy and juicy, and very red; and it is scab free, important for our organic orchard. The name, Bonkers, also has some kick, especially compared to other new scab-free apples like Pristine, Liberty, and Freedom. When I moved to Cambridge, Massachusetts to live with Paul Matisse, the father of my three children, I told him that I didn’t particularly like my last name. How could I like ‘Weiner’ when I was living with a ‘Matisse,’ one of the most illustrious names in 20th century art? Paul said, “Why don’t you change it?” I immediately thought of the traditional Japanese poets who often took pen names. The Japanese haiku poet, Basho, over his lifetime published poems using three different names. Basho was the last one he adopted after his disciples built him a little hut and planted a basho, a banana tree, in front of it. The idea appealed to me and I thought of a poetic name like River, a name taken from the natural world. Paul was quick to say, “No.” I think he imagined Linda River was too close to Joan Rivers or some Hollywood star’s stage name. “It should be a normal name,” he said, and he pulled out the Manhattan phone book, opened it at random to the H’s, and found Hoffman. So I took up Hoffman, and went to the Cambridge courthouse and officially changed my name. It was a sort of declaration that I no longer belonged to my family of origin. I was starting out fresh, a new person with Paul; I was a person without a family history. When, twenty years later, I moved to a rundown farm with a large pond in Harvard, Massachusetts, I decided that I wanted to give this new home a name. I was a small frog leaping into a big pond, not knowing what was waiting for me under the water. I named the farm, Old Frog Pond Farm, after Basho’s haiku. It felt right to name the farm after a Japanese poem. It connected me to the time when I was living alone in Japan — young, inexperienced, and passionate about the Noh Theater. Trying on a silk kimono with my Noh teacher, Takabayashi Koji Sensei. Naming the farm after Basho’s poem was the beginning of finding a true name, a place where I was grounded in the reality of the soil, physical work, and natural beauty. As I found firm ground beneath my feet, my old names no longer mattered. Unlike us, an apple likely has no consciousness of its name; it simply grows, producing blossoms, leaves, and fruit regardless of what we call it. But the name can change our perception of an apple and create its market appeal. In a similar way, our own names can make a difference. Some names roll off the tongue easily, others are poetic, or connect us to a much-loved family member. Many people at midlife go back to their full birth name, and discard their childhood nickname, capturing a new identity in doing so. In 2010, I formally took Buddhist vows, and my teacher gave me the Buddhist name, Shinji. Shin means truth and ji means soil or earth. Truth in the soil. One’s Buddhist name is meant to be a teaching, something to aspire towards. I like when I am called Shinji by my Buddhist sangha and friends, and I am perfectly happy being called, Linda, or Mama, or Babe, the name my husband, Blase, uses, or Ama, the name my granddaughter uses. We have a few seedling apples in the field near the Medicine Wheel with no names. These started growing from pips in the pumice we dumped from our apple pressing two years ago. If they continue to grow, they will each produce a unique variety of apple. Most likely the apples will be small and bitter, but you never know, one of them could be sweet and crisp, or be a great cooking apple like the Bramley seedling. And what would I name it? The Shinji apple has a nice ring, but I think the first seedling apple we grow will be named for my first granddaughter, the Vita Apple, the apple of my eye! I’ve been reading the book, Sapiens, by Yuval Noah Harari. The author’s broad lens, an overview of our species from early man to the present time, is helpful as my focus has been so closely fixed on the daily headlines. Our brothers and sisters, members of our same genus, Homo, like Neanderthal man, Homo erectus, Homo soloensis, Homo floresiensis, among others, lived on this planet for millions of years. Then, Homo sapiens (Wise Man so we defined ourselves) evolved in West Africa, and spread throughout the Asian landmass, and all of the other members of our genus disappeared. Theories abound and no one really knows whether we were responsible. However, we do know a little about early sapien ways. Homo sapiens, not content to stay in any one place, forged ahead. The first place we colonized was Australia, quite an undertaking considering the distance over land and water, but Homo sapiens did what we had been evolving to do. We stepped onto the landmass of what we call Australia where there were no other human beings, and changed it forever. Sapiens encountered great animals like 450 pound kangaroos, giant koala bears, and dragon size lizards. However, within a few short millennia, twenty-three of the twenty-four mammals weighing over one hundred pounds went extinct. Large animals have only one or two offspring and the gestation period is long. If the animal’s young are killed, even as few as one every month or so, in a few thousand years, they die out. As hunter and gatherers, we were not necessarily aware of the changes we were causing, but science points to the irreversible transformations we triggered. Homo sapiens evolved extremely quickly. Unlike Homo erectus, for example, who used stone tools and remained essentially the same for two million years — Homo sapiens wielded the hoe, the pen, and the brush, becoming farmers, and then, artists, politicians, scholars, scientists, and philosophers in a relatively short time. We developed a sophisticated language. Language, the big differential between us and other species, is how we shape our world. With language we decide collectively what to believe in, and how we envision the future. Harari makes the case that so much of our culture is myth anyway — it’s what we collectively believe. Sapiens became powerful because we learned how to collectively believe in myths—the myth of our economic system, the myth that there are countries with borders, the myths of religion. There is no scientific basis for any of these. From an historical perspective, you could say that religions developed and became dominant in a particular area for no more reason than a particular butterfly has blue wings. Perhaps we need to start dismantling some of our myths — especially the ones that separate instead of seek our commonality. The assumption is that we have evolved from our wild and wooly ways, and developed and believe in sophisticated ideologies that we hold to be true and enable us to live peacefully and cooperatively with each other. But we don’t live peacefully or cooperatively with other sapiens or other creatures on the planet and we haven’t for many years. It’s almost as if our shadow side is finally coming forth and demanding to be seen and heard. It’s not this one election — nothing arises without a cause. On our planet millions of acres of forests are gone, our topsoil is disappearing at alarming rates, our biodiversity is shriveling, and climate change is going to make large areas inhabitable because of high water and high temperatures. Greed, intolerance, and ignorance have all played their role. This week I’ve been pruning the apple orchard with Denis Wagner who first taught me to prune the trees over a decade ago. We prune in silence until one of us asks about a certain branch. Sometimes we both stand back and gaze up into the crown of the tree wondering if there are some branches that need to be pruned out to encourage growth. We confer amiably and respectfully. We both know that there are multiple choices, and no one knows exactly what is best, but each cut changes the course of the growth of the tree. In the orchard it’s easy; we both want the best for the tree. Does this analogy translate to the world? Not easily. Denis and I usually agree, and it takes very little for either of us to back down and harmonize with the other. But it does make me think that we need to talk, we need to stop building walls, stop filibustering, and stop being right. History has proved that unless we live compassionately and empathetically, we all suffer. Hunters and gatherers related to their world with an early form of religion, what today we call animism. Animists believe that humans and animals can communicate — that we can and do have relationships not only with animals, but with trees, and even rocks. We share the world with these other creatures, both animate and inanimate. As we developed, we seemed to have forgotten that relationships are important. We have been focused on the power and the rights of the individual. Perhaps it’s time to throw out this notion of the sacrosanct individual, the one who signs executive orders at 4:42 pm on a Friday afternoon and changes the lives of thousands of people. But that means each of us, too, must loosen our own hold on our individual identity and join the fray – the messiness of living with all of our brothers and sisters, animate and inanimate, no matter what they do or do not believe in. Above all, we must enter the dialogue, speak up, loudly, and compassionately. We need to tell new stories that inspire and shed light on our earth, our home, our commonness. We are all Homo sapiens. We all have a beating heart.